Feed thin and flimsy or thick and heavy transfer paper securely via the AMF (Automatic media　feeder). Continuous printing with the UISS (Uninterrupted Ink Supply System). 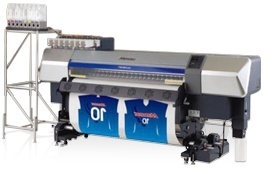 Features high density, fast drying sublimation inks for high speed printing and a dedicated RIP.